Snowden pictured at Moscow Airport 12 days ago. US INTELLIGENCE LEAKER Edward Snowden is set to leave the Moscow airport transit zone where he has been holed up for the last month after being provided with a document allowing him to cross the Russian border, reports said. The state RIA Novosti news agency said the document confirms that his application for asylum in Russia is being considered but allows him to cross the Russian border so long as border guards do not object, it said. The news agency added that the document was initially given to the lawyer helping him, Anatoly Kucherena, who was now at Sheremetyevo airport to meet Snowden. The Interfax news agency said Snowden could leave the airport in the few “next hours”. “The American is currently getting ready to leave. He is being provided with new clothes. The document will be given to him by Kucherena,” Interfax said. It said Snowden was still however in the airport transit zone and had not yet crossed the Russian border. RIA Novosti cited a source within the Russian border guards service as saying he would be allowed to leave the airport as soon as he presents the document. The migration service declined to comment and there was no official confirmation that he was preparing to cross the Russian border. 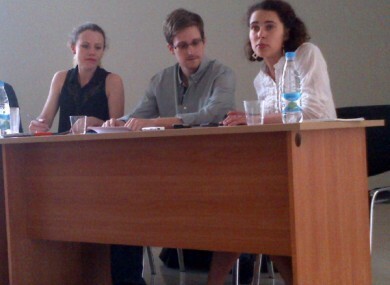 Snowden earlier this month applied for asylum, a process that could take up to three months. Kucherena has said he may even apply for Russian citizenship and is interested in looking for work in Russia. Hosting Snowden risks further straining relations between Russia and the United States, which wants to put him on trial. But Russia has refused to hand Snowden over, saying it has no extradition treaty with Washington. Email “Snowden set to leave Moscow airport”. Feedback on “Snowden set to leave Moscow airport”.